Who knew fixing the world could be so much fun? Witness as two gonzo political activists lie their way into big business conferences by pretending to be top executives and pulls the world’s biggest prank. The Yes Men Fix The World follows the adventure of trouble-making duo Andy Bichlbaum and Mike Bonanno. In this comedic documentary, the two exposes the individuals who profited from Hurricane Katrina, the ones responsible for the environmental disaster in Bhopal, and other world-shaking events. Adding humor to hard cold data catches the attention of viewers who are maybe aware of the situation but do not do anything about it or are completely unaware of the catastrophes presented in the film. The Yes Men mixes validity with heart, creating a sharp narrative that engages the audience while at the same time opening their eyes to the issues at hand. The documentary is a sharp testament on the dangers of the free market and how businesses and capitalist fat cats manipulate its power for monetary gain without thinking about environmental consequences. In this full-length documentary, The Yes Men demands private sectors to take responsibility for the damage it has done to everyone, but with a flair of laughter and a good ol’ prank. 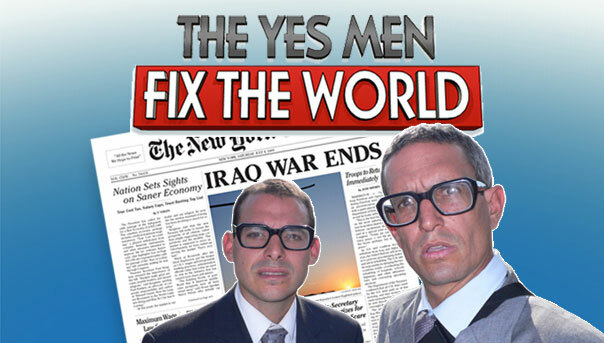 The Yes Men Fix The World features Reggie Waits, Mike Bonanno, and Andy Bichlbaum. It’s written and directed by Bonnano and Bichlbaum themselves, and is free for download as a torrent file via Vodo or Vimeo here.